Heat the olive oil in a medium-sized pan over medium heat. Sauté the onion and garlic, stirring occasionally, for 10 minutes. Add the tomatoes, beets, carrots, bay leaf, tomato paste, oregano, chili flakes, and salt and pepper. Stir for a couple minutes. Add the vegetable stock and bring to a boil. Reduce heat to low and cook partially covered for 10 minutes. In the meantime, bring a medium-sized pan of salted water to a boil and cook the pasta according to package instructions. Add the mushrooms to the tomato sauce, mix well, and cook for an extra 10 minutes. Remove the bay leaf. When the pasta is ready, drain it in a colander and transfer it to the pan with the sauce. Mix well so all the pasta is covered in sauce. Serve and sprinkle each portion with grated walnuts instead of Parmesan cheese. 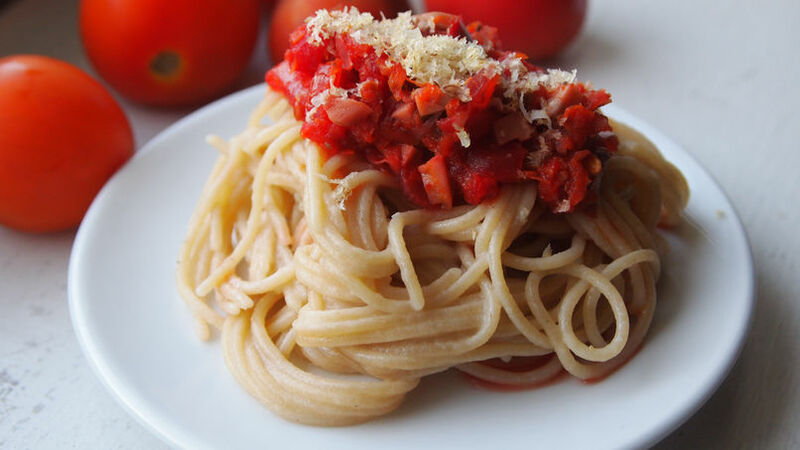 If you're in a rush, or if it's not tomato season, you can use canned, chopped tomatoes instead. I prefer to use fresh tomatoes, but every cook is different. Use this sauce over any kind of pasta or to make vegetarian lasagna. I may write a lot about Latin food, but in all honesty, I think Italian dishes are my favorite. I never get tired of eating a fresh plate of pasta (any shape works, although I have a soft spot for fettuccine and capellini), mixed with tons of homemade sauce, and topped with some freshly ground pepper and perhaps some basil leaves. Ahhh… heaven! What I love the most about pasta is that it's simple and versatile, and it's the perfect canvas for any flavor you may want to add to it. Fresh vegetables can shine in all their glory when chaperoning a plate of steamy al dente pasta. This past week I created a "grounding" red smoothie for my holistic wellness blog, and that inspired me to use the ingredients I had used for the juice (carrots and beets) in this dish too. The ground meat that is used to make traditional spaghetti Bolognese is red and has a very grounding energy as well, so I thought my two colorful veggies would be the perfect replacement. And as is always the case when I make vegan recipes, I added finely-chopped mushrooms to recreate the texture of meat. I really enjoyed the spice, sweetness and intense color of this dish. If you're a vegan, you will love it. If you're not, you may start wondering why you don't eat vegan food more often! Buon appetito!